Enchanted Lily Sneak Peeks, Day 2. Enchanted Lily will be available for purchase on Feb. 23. I forgot to mention yesterday that February's guest designer for Pink Cat Studio is Suzanne Dean, so be sure to stop by and see her sneak peeks too! (Please excuse the watermark over the words, shoulda put it elsewhere, oops!) It reads: thanks fairy much, and I highlighted fairy with a copic. Lily is colored with copics, and I added LOTS of shimmerz as you can see by the second picture. This set just calls for lots of bling and glitter and shimmer and fun stuff! And here's Lily on a lily, how about that! If you look at the second picture you can kind of tell, but I stamped the lily on vellum, colored it with copics from the underside, and pieced it on. I think it gives it a nice subtle, frosty look. Really, I had to do it because I didn't have the right color of copic that I wanted to use! I did remedy that, but it is too late for this peek, lol! Again her wings are covered with Angel Wings Shimmerz. Stickles make her flower wand just sparkle! Thanks for stopping by, check out the rest of the team's peeks! 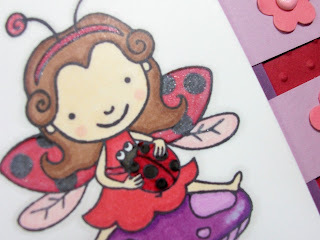 I love the pink shimmering wings and the lady bug in the other one!! Great job!! Becky both of these are incredible!!! I love the purples and pinks on the first card and of course the shimmer and bling are amazing!!! the second though with all the little flowers at the bottom and the vellum is ingenius!!! Wow, so, so awesome! Both of your cards are adorable Becky!!! I love the layouts! These are too cute, Becky!! Lily is a doll!! These are so pretty again Becky. I adore your style, I don't know how to describe it but I love it. I think the effect of the vellum is just gorgeous. Have a great Sunday (or what is left of it in your part of the world :) ). Both are so pretty! 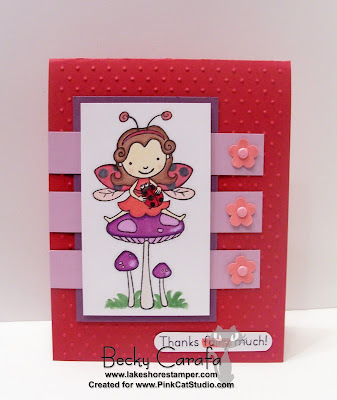 Love the bold colors you used on the first one and the layout is fab! 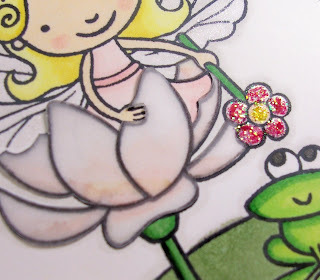 Great idea to stamp on vellum--so soft & pretty! Wow, Becky!! 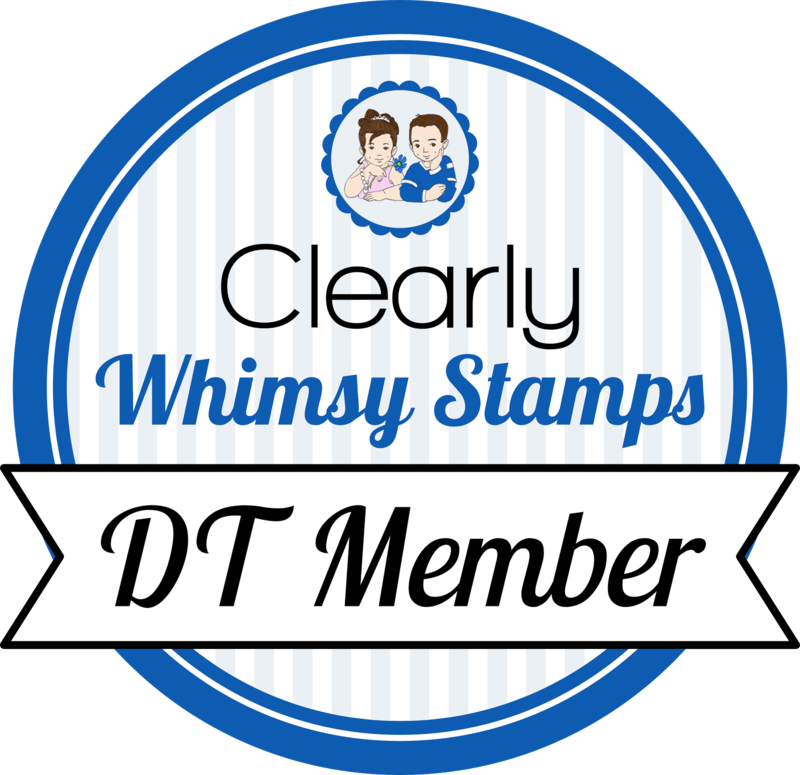 I love the CB embossing and the colors of your first card. Such a beautiful color combo. The layout is fabulous too...love the strips of cardstock going across that way. 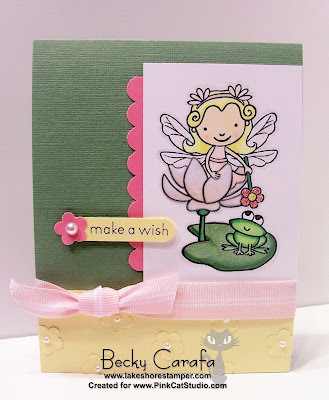 I love the subtle colors of Lily on your second card and again the color combo is fabulous. Love the shimmerz and Stickles that you added. Beautiful job on day 2 sneak peeks!! These are TOO cute, Becky! Love them both! Love your purple and red together!! Great coloring on both cards!=) The layout on both cards are great! more fabulous work, girl! love the layouts and all the little details you added. totally cute!